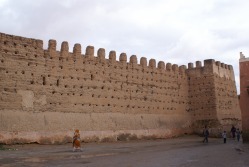 We visited Morocco for the first time in January 2010. It is a huge country and unless you go at break neck speed or stay for three months you won't see it all. We returned in January 2011 to see a little more. We took the ferry from Algeciras to the Spanish enclave of Ceuta and crossed into Morocco from there. In southern Spain there are lots of places to buy the ferry tickets but we go to the travel office near Lidl at the Palmeras shopping centre at Algeciras. 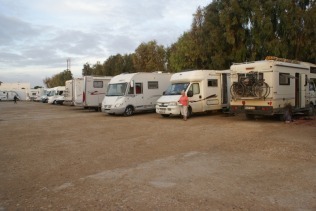 In January 2010 an open return to Ceuta for a motorhome and two people cost us 230 euro. In 2011 we went from Algeciras via the new port of Tangier Med - this cost only 180 euro return and was very smooth and efficient. Southern Morocco is warm in winter, the roads between the main towns are generally pretty good, fuel is cheap and the scenery amazing. In 2011 diesel was about 70p a litre. The great thing about Morocco is that it is a country of so many contrasts that you can have the sort of holiday you choose - lounging by the beach, trekking in the mountains or exploring the desert. 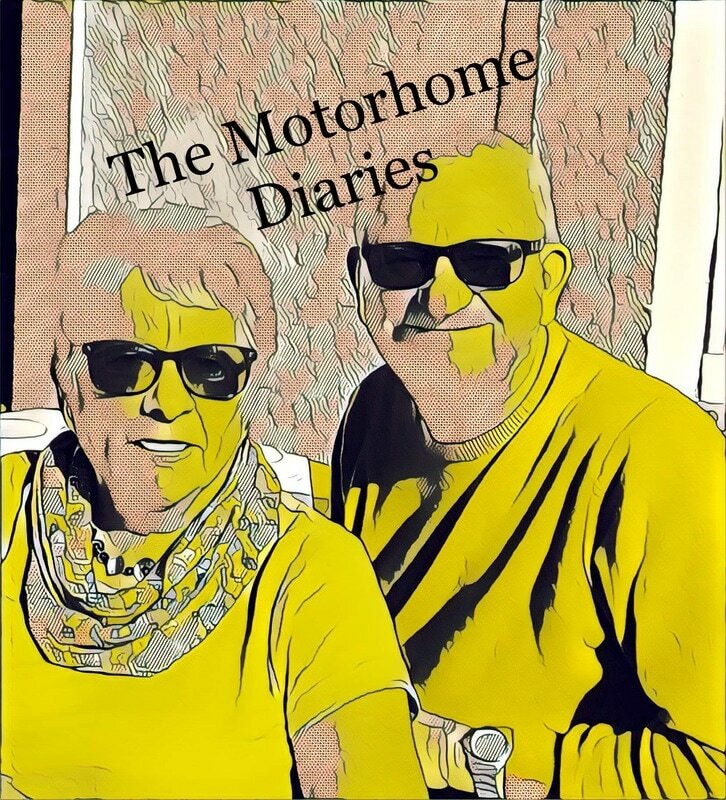 Between the two trips we have spent about 14 weeks altogether in Morocco, if you think that we may be able to answer some of your queries about motorhoming in Morocco then Get in Touch. * Get a decent map, most people buy the Michelin one, we had the Rough Guide map. Do not assume you will pick up a guide and map once you are in Morocco. * Get your Green Card from your insurers. * Stock up on any pork and alcohol you may need. While the guide books refer to a limit on fags and alcohol coming into the country we have not come across anyone who has had a problem. * Consider whether to update your satnav with Morocco maps, although the further south you go the less you need your satnav as there are not too many roads. * Do not bother buying tickets before you leave, the ticket office near Lidl at Algericas offers good deals. * Bring an unlocked dongle for internet access and buy your sim card in a mobile phone shop in Morocco, or buy a dongle and sim when you get there. We did, and it was fine. We recommend Maroc Telecom which has better coverage -even in the desert. * We did not take any spares, there are lots of garages and mechanics about and they seem to be able to mend most things. We met a few people who had had running repairs undertaken and they were happy with the work and the price. * You will be faced with kids asking for sweets or pens - if you like to do such things then make provision for this. We think we should not be encouraging children to beg on the side of the road as vehicles fly by. * Bring a French dictionary, some people can speak English but French is spoken everywhere. * check your travel & health insurance, our insurance included Morocco in its cover without extra cost. 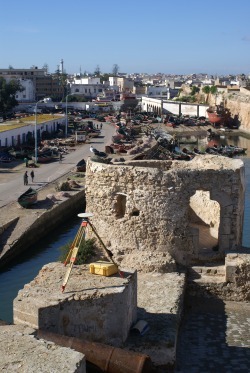 El Jadida is on the coast and has a magnificent old walled city called Cite Portugais which dates from 16th century when the Portuguese built the place to protect its ships from pirates. A charming old town with a beautiful cistern - see photo above. 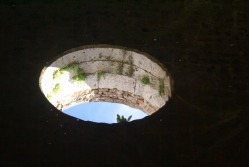 The cistern is lit from one hole in its roof, see picture below. Also the old city has nice ramparts and a communal bakery. Unfortunately we could not take photos in the bakery but went in and saw the shelves full of bread on little wooden trays each covered with the owners cloth to identify their bread. Outside the walled city there is a thriving town with plenty of shops and a good market. There is a campsite which is within walking distance of the town. The facilities are not up to much (sordid might be a better description) so you will have to use your own. There is a small shop at the entrance where you can buy essentials. 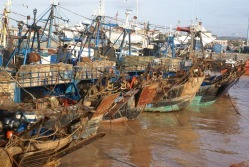 Essaouira - another nice town on the coast. 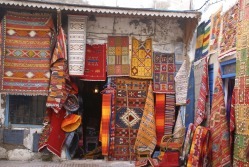 The old walled city has a great market and shops and you can buy most things there (see the carpets on display below).It is also very relaxed and found a complete lack of hassle. It is a popular surf spot (it is not called the Windy City for nothing) there are lots of surf shops in town. Within the old town is an excellent harbour where the fishing boats come in each day - plenty to see here and fish to buy. We were accosted by a local who gave us a guided tour and with the help of a note book with simple sketches explained how to bait the hooks for different sorts of fish and when the fishing boats had to go out. Apparently mackerel is good bait for sharks. Near the fishmarket is a range of fish stalls where you buy the fish or shellfish you want and then have it cooked for you. Just offshore is an island where Eleanors Falcon comes from Madagascar to breed - unfortunately not while we were there. The campsite is small and generally pretty full because the town is a must see on any tour of the country - it's a bit like parking in a car park but its staff are helpful and work hard to keep the simple facilities clean. You can buy fresh bread on site each morning. 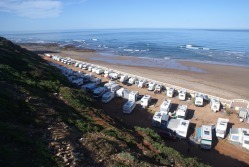 This is a massive campsite north of Agadir and near Taghazout. We think that there are over 700 pitches and it's very popular. Most people there are French but we found ourselves in the Italian quarter where the ladies next door where making pizza for sunday lunch. You can get anything you want here - new covers for the motorhome, a painting on the side of the van, wind breaks, safari rooms, solar panels - motorhoming visitors have created quite a cottage industry. It is also a place where people come to stay for a long time and where you can hire chalets. Sidi Ifni is south of Agadir and was a Spanish enclave until the 1960s. Not much evidence of Spanish occupation remains although the guide books refer to Spanish art deco buildings and if you look hard you will find them. 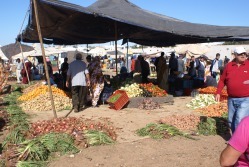 It is a relaxed town with a vegetable and fish market every day and a large market on the edge of town at the weekend. We found fabulous patisserie here made of almonds honey filo pastry - each one a piece of bite sized perfection. There are three campsites here and it is a popular place, this is our site in the photo below. Like so many of the towns on the coast this is a popular surf spot an on the day we arrived there was a surfing competition/exhibition on the beach next to the campsite.Load blaring reggae music on one side of the wall, and middle aged French campers chilling on the other side. Unfortunately the in Tizinit was full so we only paid a day visit. We had to camp about 15 miles away at Aglou Plage as it was impossible to wild camp in town. There is a rather nice mosque in this town and some very nice city walls. This is the old toilet block at Aglou Plage in 2s 010. we visited again in 2011 and the transformation was amazing, only sorry we did not take more pictures on this second visit so we could show before and after shots. Lovely new sanitary block, the old one was refurbished and now there are shops on site including one which makes the awning windbreaks etc.This is a popular site and it is clear that some of the vans are there for the season. It is a short walk to the sea front. Older books may refer to wildcamping in front of the hotel down at the front but this is no longer possible. 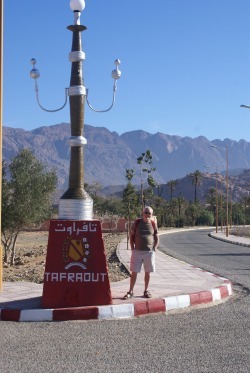 Tafraoute is in the Anti Atlas Mountains. This bustling town is surrounded by the granite mountains and is a lovely place to stay for a few days. The drive up the mountains is quite breathtaking and there are some spectacular views. The road can be a bit hairy at times but the journey is worth it. There are several campsites and wildcamping is possible. This is a good place for hiking, cycling or 4x4 trips into the mountains. We used Tafraoute Adventure and had a wonderful day out visiting Ait Mansour gorge area and the six thousand year old rock etchings. Our driver took us to Ait Mansour gorge and dropped us off at the beginning so we could walk through and catch up with him later. This is a beautiful spot, very quiet with the steep walls of the gorge in this red stone. It was very windy on the day we went so we were able to pick up windfall dates and eat them as we strolled along. You would have difficulty reaching these engravings other than in a 4x4. If you look carefully you will see that there are horned animals, the lower left is possibly an ibex? We went hiking in the Ameln valley with our companions Michele and Arthur. 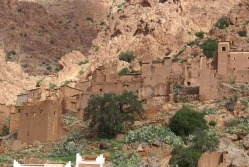 There are a number of deserted Berber villages here - people have moved down the valley and built new villages in many cases. This is a good area to go walking - unfortunately it is hard to tell where you are as most of the villages do not have sign posts and those that do tend to have the signs in arabic. We hired a taxi to take us to the valley and then arranged to call the taxi driver to come and pick us up when we were finished. 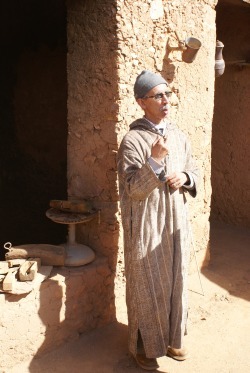 In the Ameln valley is an old Berber house which has been turned into a museum, this picture shows the owner and guide who gave us an interesting glimpse into bygone days. There is a "parlour" but we could not go in there as there was a German tour party being entertained with tea in there. This man's family had owned the house for several hundred years and he was able to guide us in fluent French but he could also speak German and a smattering of English. There was no entrance fee as such, you just made a donation at the end. Much to Michele's embarrasment two of her French compatriates took the tour but left without making a contribution. After several weeks of shopping in markets and hole in the wall style shops (see photo below) we got rather overexcited when we got to visit a Moroccan supermarket. Marjane is a countrywide chain of supermarkets, they are like continental style and sell everything including little plastic washing machines which are great for us campers. Marjane is also the place to stock up on beer and wine although some small towns have somewhere you can buy alcohol but these are not well advertised, and you will have to ask. Otherwise it is the markets and local stalls for shopping. These are fine and sell most things. At the vegetable stalls you take a plastic bowl and put all your purchases together and these are weighed together as in many places the price is the same for peas as for potatoes. This is a surfing and fishing village, and when we were there maybe more surfers than fishermen. A windy road took us down to the village and on the way we passsed an area which is excellent for fossils - lots of huge ammonites to be found there. We never stopped as it was a bit of a scary drive and there was a steep drop on one side and road works ahead making the road even narrower. We subsequently found a less hair raising way out on the other side of the village. Fabulous waves along the coast at Imsouane. We were thrilled to see a huge flock of the very rare bald ibis. There are thought to be only a couple of hundred in the world. These moray eels were on sale in the fishmarket at Imsouane. Sidi Kaouki is just south of Essaouira and there is nothing very much there so if you want some quiet time then this is the place to come to. The camp site is excellent and one of the few that we found that has marked out pitches so that you have some space and don't feel that you are camped in a car park which is how it felt elsewhere. In addition there were excellent sanitary facilities with hot showers, soap, loo paper and toilet seats - if you are a camper in europe you know that this means it's an unusual site that provides all these things. You could arrange to have a tagine made for you and delivered to your outfit. At this campsite the bread man came on his donkey - he sold traditional Moroccan flat bread, still warm from the oven or was that still warm from the donkey? Sometimes he had pain au chocolat too. His bread was a penny or two dearer than elsewhere but everyone there thought it was well worth it for the donkey alone. The same guy returns later in the day with fresh vegetables. In addition the fishermen come with fish which they will gut and fillet should you wish it. 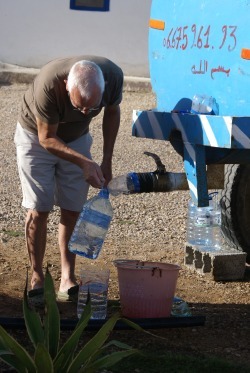 The water came to the campsite each day in a bowser and was then pumped into the site water tanks. However one day there was a power cut so we all had to take our water bottles to the bowser to fill it up. There was some great improvisation to create a tap that we could all use involving an old water bottle and a bit of inner tube , see below. When we left the coast during our 2011 trip we headed inland to Taroudant with the snow capped peaks of the High Atlas accompanying us on our journey. 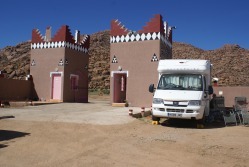 There is no campsite in Taroudant but according to the guide books there are two places where motorhomes can park. In practice one of those places was full and the second had been sucked into some city wall improvements and was now a rather splendid public open space with a fabulous fountain. However there was a nearby side road which had been commandeered for wild camping (or camping sauvage as the French describe it) and we joined 30 other vehicles for our overnight stay. The city has some magnificent traditional city walls that are some 7 kms in length. 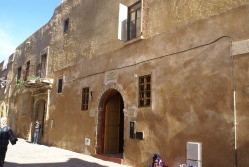 Inside it was a traditional Moroccan city, lots of narrow roads, roadside cooking souks and pavement cafes. It is sometimes called little Marrakesh, a Marrakesh without the hassle. We spent a few hours in the afternoon sauntering around the town and through the souk. The city walls rendered with mud, the snow capped High Atlas and the water from the new fountain (with consequent rainbow) made the whole thing very very picturesque. Taliouine which is the centre of the saffron growing area and was a bustling small town with plenty of roadworks on the way in. We subsequently established that the King was touring the country over the next few months so hence the evidence of town sprucing up wherever we went. In Taliouine this involved putting in kerbs and footpaths. 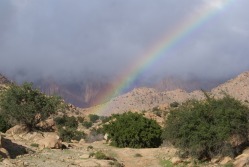 Our campsite was a few kilometres out of town and we had stunning views across the valley at the old Kasbahs. 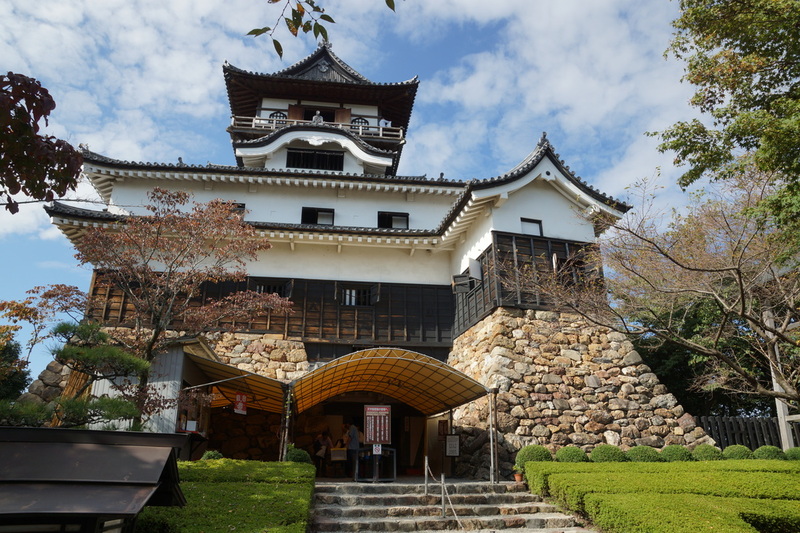 One day we walked back into town to buy some saffron, there is a saffron museum as well as a saffron cooperative and it became clear that it brought in a substantial income to the area. The yellow in Moroccan carpets is fro saffron. The museum is new and has an informative video in Arabic or French and some displays describing the production of saffron and a number of more unusual uses for saffron which included as a healing aid after circumcision. There was a bourse within the museum containing lots of stalls selling saffron, unfortunately when we where there most of these were closed. We got the feeling that this museum was very very new and so in time the bourse could well develop into a good place to buy saffron. Our saffron was about 3 euro a gram which is much cheaper than in UK but not sure how much cheaper than in Spain which is usually where I buy our saffron. Our nights in Taliouine where we were at 3500 ft were the first really cold ones we had experienced. Our cheap thermometer (one euro from Chinese bazaar) did not seem to record low temperatures very well but a couple of German saloon cars had frost on them one morning. In Zagora there are three campsites, one on either side of town and a third very conveniently located near the centre which was the one we were looking for. We never found that so ended up at the one at the other side of town which was not so convenient. This was located in a Palmerie with very tall date palms (the dates were being eaten by the sparrows and bulbuls) and mostly we were the only people there. A French couple spent one night there and then moved to the one in town – we assumed that they wanted some company. Next door to our van was a compound with five camels in it, we think that they were used for camel treks. Fortunately they were pretty quiet and did not wake up too early and wake us up. As it was we are woken each morning by the muezzins, in the cold early morning air the sound of several muezzins echoes over the valley. Zagora is quite a sizeable town and it is here that you see the first signs advertising Sahara Desert tours as well as traditional clothes. There was a huge market twice a week which we managed to miss but an indoor market which is open every day. In all the markets we have visited you pick up a plastic bowl and fill it with all the items that you want and then these are weighed together – ie no difference in price between a tomato and an aubergine. The quality of fruit and vegetables continues to be very good and everything is about 50p a kilo. 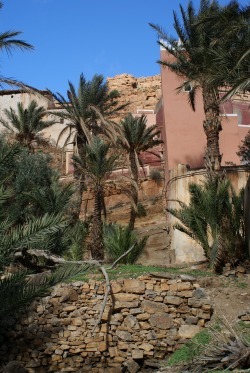 The road to Zagora is lovely, lots of palm trees, Kasbahs and old traditional Berber villages. The end of the tarred road is at M’Hamid after that it is desert pistes or tracks. 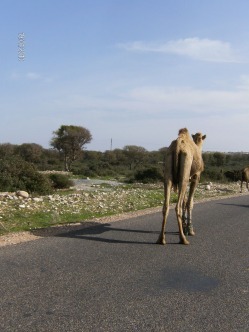 Shortly after leaving Zagora the road turns to strip tar and Gilroy enjoyed playing chicken with the oncoming traffic, deciding who will move over first. This is ok from where he sits but I am in the passenger seat which in our vehicle means I am in the middle of the road and see these oncoming vehicles coming straight at me - not always so much fun . Anyway, we got to M’Hamid safely and camped at Camping Hammada du Draa where we signed up for a trip to the desert and a night under the stars. The campsite was rather nice, warm water, loos with paper, a restaurant and washing machine. It also had rooms to let that reminded us both of rondavels we have seen in South Africa, functional buildings built in local style but with a certain rustic charm. Sitting beside the huge log fire we could not believe just how cold the desert could be, “Come closer” says Mohammed to me pushing me even closer to the warmth. We were spending a night in the desert arranged by our campsite in M’Hamid in Morocco. We had set off that afternoon in a large Toyota Land Cruiser which was loaded with me and my partner, four French tourists, the driver, our dinner, extra blankets and water. As we soon discovered the Sahara is not all sand and we had a very bumpy journey crossing the rocky pistes. Despite it all looking very much the same to us our guide new his route and soon stopped so we could go fossil hunting. All being of a certain age we each collected a few fossils to take home to our grandchildren and then were on our way again. We were all motorhoming so no worries about taking rocks back to Europe. We stopped again to water some donkeys lurking around a well. The driver pulled off the heavy metal cover and dropped the old plastic oil container on a rope down to pull up the water, something he did four times until the beasts had quenched their thirst and wandered off again into the desert. Our camp for the night was half a dozen Bedouin style tents, one for each couple and then the sale a manger – a beautifully decorated tent with carpets underfoot, the walls draped with traditional wall hangings and the plastic garden chairs camouflaged with blue damask covers. Each tent was pretty basic, but again, carpeted underfoot with a mattress and lots of blankets, this should have been a warning of just how cold it was going to be. Having inspected our sleeping quarters we all hiked up the nearest sand dune to watch the sun set over the desert and to watch the view change to a golden red and watch the shadows develop behind the dunes. While up at the top we were joined by a group of French twenty somethings who were hiking around the desert with their bags being carried by an accompanying camel train. Who said the desert was an empty place? Back at our camp we were joined for dinner by a couple of French quad bikers and their guide Mohammed. The pastis disappeared quickly, the whisky was going the same way until it owner removed it. Dinner comprised harira soup with flat bread followed by a meat tagine and couscous and we ended with the ever present sliced orange with cinnamon. It was a lively and noisy evening and Mohammed had made some fair dents into the alcohol before we decided to end the day under the stars and near our large fire. The sky in the desert is so much bigger than at home and the stars almost seemed within reach. Once you get to M'Hamid you will find lots of companies/individuals offering you a trip into the desert. We cannot have a page on Morocco without referring to the climbing abilities of Moroccan goats. These goats are climbing argan trees to find the nuts. As you drive south the goat herds, often small children, will wave at you to let you know their goats are in the trees. They know everyone wants a photo of goats in trees and if they are lucky they will earn a small commission. Argan oil has cosmetic and culinary uses and traditionally the goats were encouraged to eat the nuts, the women would then recover the nut from the dung and then they would grind the nut (presumably after a good wash) to get the oil. Apparently the goat's digestive system breaks down the hard outer shell of the nut. 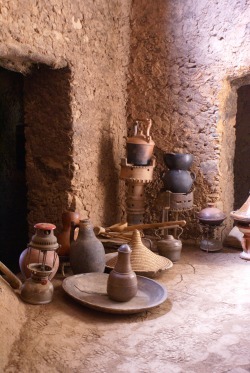 I am not sure whether all argan oil is produced in this way today, I rather doubt it as there is a lot on sale. 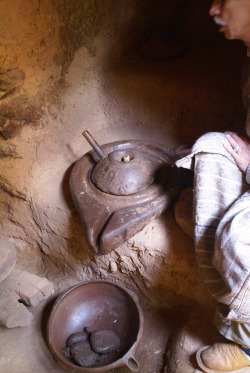 No part of the argan nut is wasted, what is left after the oil has been extracted is used for cattle feed. If you are following well trodden tourist paths then you don't need a vehicle like this big yellow beast. I guess that 4 x4 vehicles are great for desert bashing but you can go to Morocco in a saloon car or regular motorhome and manage perfectly well. There are some decent dual carriageways that are like motorways. The main roads too are generally very good.Some of the smaller roads are little more than strip tar and so you do have to be prepared to share with oncoming traffic. Fuel is relatively inexpensive 73 Dhms for a litre of diesel, that's just over 60 pence. There is a high police presence, either at speed checks or police check points where papers are checked. Some of the vehicles on the road were interesting classics, old Bedford trucks and a full range of old Renaults including the trusty Renault 4 of which many seem to survive worldwide. 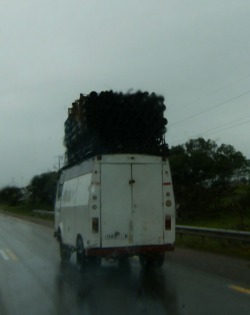 We saw plenty of vehicles which carried huge loads see photo below. In bad weather though the roads can be treacherous, there is a lot of flooding and land slips, on our journey home we saw about half a dozen accidents in the space of an hour. 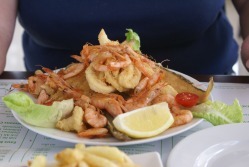 Food in Morocco is excellent and by european standards very cheap. Fish dominates along the coast but there is plenty of chicken and camel too. 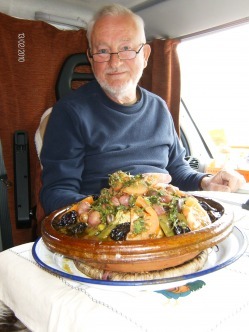 Tagines are of course a typical Moroccan dish and we never had a bad one and on many campsites there was a side line in preparing tagines for campers. Tagines come as fish chicken vegetable meat ( no further detail) or kefta (meat balls). There are also brochettes (kebabs) couscous and pastilles - I recommend this last dish, it is filo pastry pie and inside is lots of sea food. We found that in all the restaurants we visited that the food was cooked especially for us and so dining was a leisurely process. It was unusual to be able to buy alcohol with your food. Marjane sold beer and wine but we did not find any anywhere else. Near the camp site at Sidi Ifni the hotel next door had a bar where you could buy a beer and watch the sunset but this was unusual, we relied on our own supplies until they ran out and then were too mean to buy more - £1 for a small can of beer. The fruit and vegetables in the market were excellent, good value and good quality but of course as you drive through Morocco you find large parts of the north devoted to agriculture. We drove from Agdz to Camping Ait Oudinar up the Dadés Valley from Boulmane. The site is a touch cosy – we didn’t like the look of the lower terrace (a bit damp and soft) and though we found a pitch on the upper terrace we had to double-up on the electricity with Damien and Julie in their VW camper. These were the first English people we had seen in weeks and it was nice to have a conversation in our own language for a change. Reckon this is the first time we have used our binocular multi-connector which we bought over a year ago. The facilities are rather limited – two euro-bogs, a Turkish bog for emptying black and grey water, a couple of showers. On Sunday we joined a 4WD trip with Daoud from the hotel next door up the Dadés Gorge, along bumpy pistes across part of the High Atlas mountains, above the snow-line above 9,000 feet, and then back down the Todra Gorge. Some fantastic scenery up there. India …. and not sure why they needed such a large number of crew and vehicles, including a catering truck. Once the road ran out we were on to what is known locally as piste, i.e. a track. This was always bumpy, occasionally violent, and had a few Jeremy Clarkson in the Andes moments when the sheer drop got very close. This is where we stopped for lunch. Bread with cheese triangles, an apple and 7-Up. Delicious. On the road again we were above the snow line and heading for the pass between the two valleys at 9,200 feet. At the top it was cold and crisp and you could see forever. On the piste we saw several flocks of Horned Larks and – in one village – a wonderfully rickety bridge serving the small irrigated gardens. We carried on down the piste to the top of the Todra Valley and then through the gorge where– at last – Sheila managed to get a Gazelle made out of palm. She really wanted a camel but you take what you can get. There were several Nomad encampments up in the mountains, one them occupying a cave made by an overhang just like those at La Roque St-Christophe in France which we visited in September. fierce dog which sounded as if it would have torn us to bits if it had managed to jump through the window. We got back at about 6pm so it was a long day, but well worth 1100D (100€). We would not have fancied taking the motorhome through the gorges – too many tight blind bends with nasty overhangs. The campsite is in the grounds of a small hotel and we ate in the restaurant one night. The menu was the same as everywhere else, i.e. brochettes or Tagine but the quality was good. In addition there was a roaring log fire which was essential as we were several thousand feet up and it was very cold at night. The higher we went the more fantastic the views. This is one of the narrower parts of the roadway through the Dodra gorge and the overhang is a bit low - we opted for guided tour. ... and at the top they were shooting an ad for Indian television. 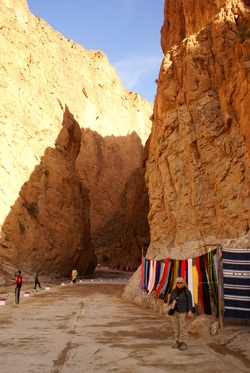 Me standing on the road through the Todra gorge. Us with Daoud, our guide. The Anti Atlas in the background. 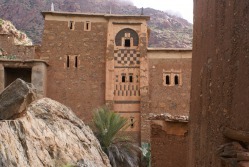 From M’Hamid it was back along the strip tar, through Zagora and overnighted in a very nice campsite in Agdz which is located next to an old Kasbah in a palmeriae. The facilities were nothing too special, although there was a restaurant and free wifi and the location was wonderful as you can see below. Agdz itself a pleasant little town with shops, a small market and a bank. At Merzouga we took another trip into the desert. We had a driver and an aged Land Rover for the day and saw parts of the area that would have been impossible with a motorhome. 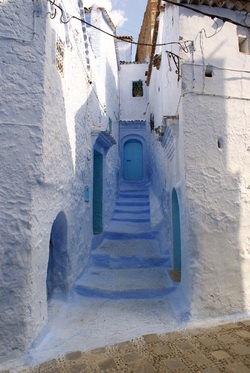 On our way back north to Tangier Med we called in at Chefchaouen known as the blue town. Rather touristy but nice for a short stop despite that. The campsite is just a short walk away from the centre of town but it is a steep climb up to it. 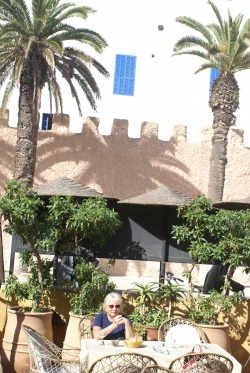 As you can see from this entry we thoroughly enjoyed our visits to Morocco. For a contrasting view look here at the opinions of Dr Bob who was in the country at the same time as us.